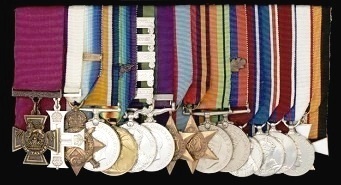 - 1914 Star with clasp "5th Aug-22nd Nov 1914"
- Victory Medal 1914-19 with " MID Oakleaf "
- War Medal 1939-45 with " MID Oakleaf "
VC Gazetted [ London Gazette, 29 June 1915 ] Richebourg L'Avoué ( Battle of Festubert ), France, 18th May 1915, Lieutenant John George Smyth, 15th Ludhiana Sikhs, Indian Army. VC Citation "For most conspicuous bravery near Richebourg on 18th May 1915. When a bombing party of ten men, who voluntarily undertook this duty, he conveyed a supply of ninety-six bombs to within twenty yards of the enemy's position, over extremely dangerous ground, after attempts of two other parties had failed. Lieutenant Smyth succeeded in taking the bombs to the desired position with the aid of two of his men ( the other eight having been killed or wounded ), and to effect his purpose he had to swim a stream, being exposed the whole time to howitzer, shrapnel, machine-gun and rifle fire". MC Gazetted [ London Gazette, 27 September 1920 ] Waziristan, North West Frontier, 22nd October 1919. Captain John George Smyth, 15th Ludhiana Sikhs, Indian Army, Headquarters, 43rd Infantry Brigade. MC Citation "For gallantry and initiative at Khajuri, Tochi Valley, on the 22nd October 1919, when, having been sent forward from Idak to clear up the situation, his quick appreciation, disposition and leadership averted a serious disaster and contributed largely towards the saving of a valuable convoy attacked by the enemy. He showed great gallantry under heavy fire, inspired his command, and brought the convoy safely to Idak". 1914 Star, clasp "5th Aug-22nd Nov 1914"
Victory Medal ( 1914-19 ) + "MiD Oakleaf"
"Mahsud 1919-20" - "Waziristan 1919-21"
"Afghanistan N.W.F. 1930-31" - "North West Frontier 1935"
War Medal ( 1939-45 ) + "MiD Oakleaf"
As John Smyth was created a baronet he was entitled to wear the Baronet's Badge, worn at the neck suspended from a blue-edged orange ribbon. The Baronet's Badge had to be purchased privately. However, no photograph shows John Smyth wearing the Badge, nor is it included in his VC medal group. Therefore, it can be assumed he did not buy it.